A belt has to know it's limits. As is frequently said, "Chains are for racing...Belts are for holding up your pants". When you start putting in high compression big inch engines, or high output turbos, you are going to start snapping final drive belts. Hayabusas, BMW S1000RR's, or any highly-engineered 180 to 195 hp street bike, would never have a final belt drive. A 140 to 360 hp Harley surely needs one. Available in Gloss Black finish. Don't ask us to chrome them as swingarms don't belong in acid and chrome tanks. We do not offer fabricated Aluminum Swingarms for strength reasons. If you have a 1000 lb Honda Goldwing with a complex dedicated heat treated casting OEM swingarm that's fine...but cutting up rectangular extrusions and welding them together with angle cuts and doing no post-fabrication heat treating or ageing is patently not a good idea. 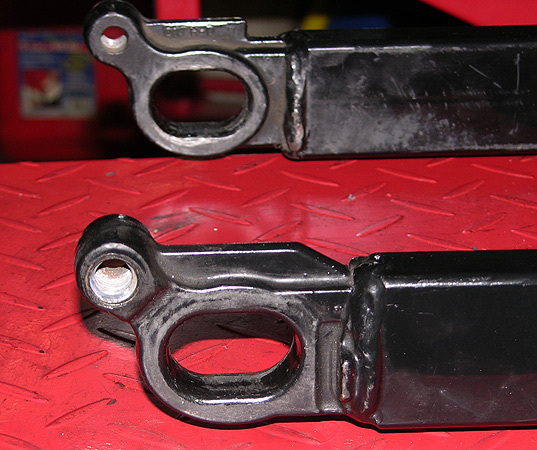 Late model Touring Harley swingarms are heavy but they are never going to bend or break. We got an education in that in the early 1980s from someone who used molten salt heat treating of aluminum motorcycle swingarms. Normalization and post weld heat treating back to a T6 condition. A 24 tooth #530 sprocket replaces the OEM belt drive pulley on the 2002-2008 models. 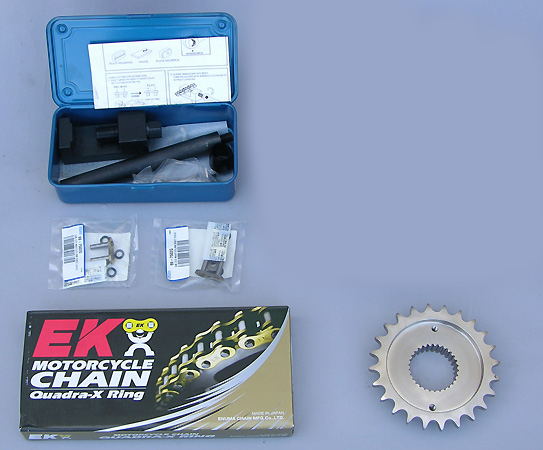 A 26 tooth #530 sprocket replaces the OEM belt drive pulley on 2009 and later models.The EK 530 ZVX3 O-Ring Chain simply does not stretch. We've been involved in racing for well over 35 years and there simply are not any final drive belts on race bikes. If you leave your bike stock, or lightly modify it, keep your final belt drive. If you are a horsepower freak or you want flexibility in your final drive ratio then go chain drive. Pre 2009 model shown with stock to 2" adjustment. The stock adjusters only offer +/-1/4" (12.7mm) of adjustment which is sort of understandable as the factory belt is a fixed deal with a certain drive ratio and belt length. This simply does not work if you want to go chain drive because +/- one link or +/- one tooth on the rear sprocket and there is no way you can get correct chain adjustment. We modify your FL swingarm for 2" (50.8mm) of movement in stock lengths. 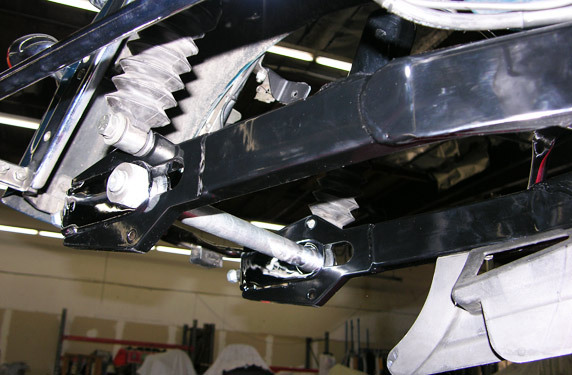 We also offer modifications in 4" (2 to 4) longer and 6" (4 to 6) longer. Shock eye location remains stock. Plus 4" or Plus 6" are special order. There is an extra charge for this as the oem Brake Anchor Shelf needs to be moved and a new one fabricated. 6" over is the longest chain/swingarm conversion we offer. The range of adjustment in this arm is +4" to +6". There is an extra charge for this as the oem brake anchor shelf needs to be removed and a new one fabricated so the stock OEM brake caliper can be used...Ask RB Racing about this for +4 and +6 extensions. Plus 4 and +Plus 6 Require 150 link EK chains. For 4" and 6" over swingarms we need to remove the old brake anchor shelf and fabricate a completely new one in a new location. This involves about four hours of sawing, grinding, sanding, and refinishing plus the new fabrication and welding. The OEM Harley brake anchor shelf is welded completely around, 360 degrees, so all the welds must be removed on both faces of the formed swingarm surface. The brake anchor shelf has been resized for the full 4" to 6" adjustment. There is a $200.00 difference for the additional labor and fabrication compared to the +2" arms. Here are the stock adjusters. Put a 1" axle in a 1.5" slot and you can only move it +/- 1/4" (12.7mm). They have to go. 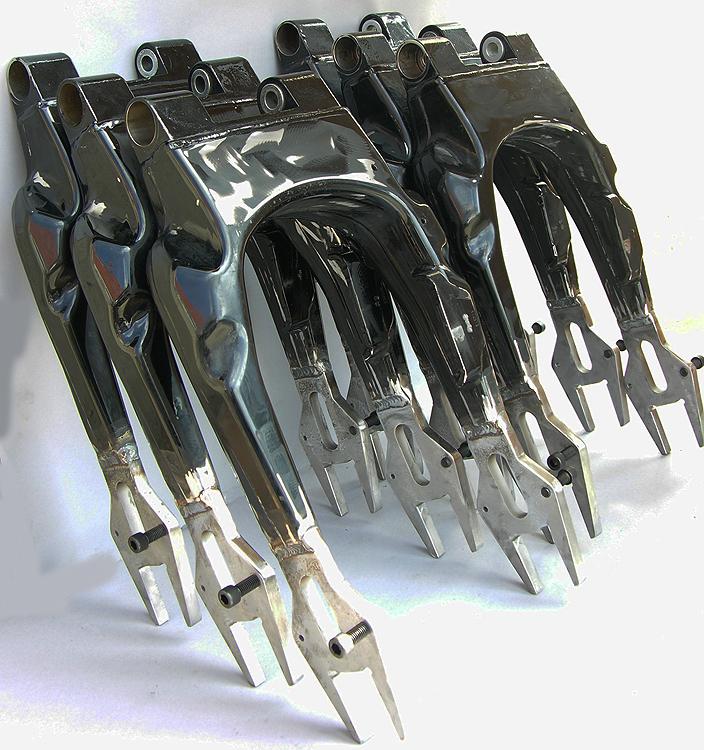 Pictured above are the new chromed chain adjusters offering 2" (50.8mm) of adjustment. Chrome adjusters come with four bolts (two sets): One set for up to 1"over stock and one set for up to 2" over stock. Alignment measurements can be taken with vernier calipers on total bolt length from rear of adjuster. Locking nuts are supplied. Procedure is to set length with 5/8" socket on the bolt. Then holding the bolt head in place tighten the locking nut with a 11/16" wrench. Note: When the chain is finally adjusted, hold welded nut on rear axle and final tighten cone nut to 95-105 ft-lbs (128.9-142.4 Nm). Install new e-clip in axle groove. 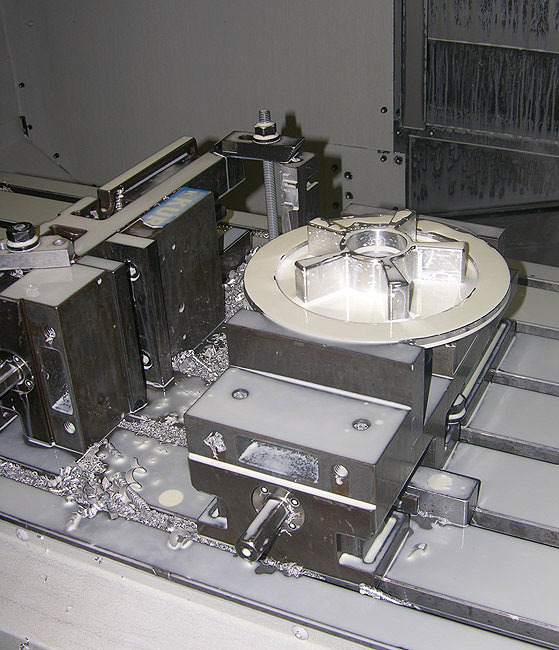 Chain Drive Swingarm Fabrication: Precision sawing of aluminum and steel billet parts, CNC mill and lathe machining, CNC mill and CNC lathe fixtures, manual lathe machining, multiple welding fixtures, heliarc (TIG) welding. MIG welding, high speed belt sanding, manual hand sanding and finishing, bead blasting, powder coating, polishing, chroming, color buffing, bearing preparation, retapping of threads, chrome polishing, swingarm polishing, touch up finishing, wrapping in plastic wrap, and packaging and shipping. Easy… Not! CNC machined and fabricated swingarm adjusters...Here off for final polishing and chroming. 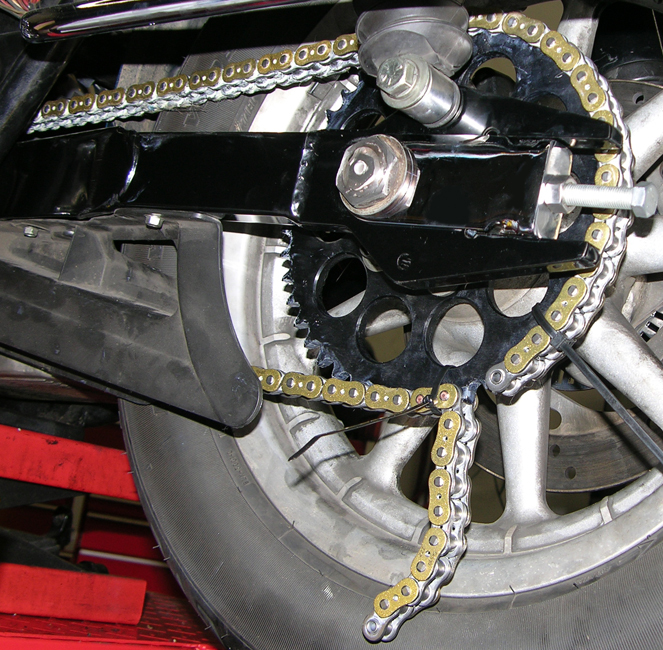 Gives full two inches of chain adjustment on our modified swingarms. We geared our 2004 Turbo Road Glide a bit taller: 24T transmission / 45T rear sprocket so we can cruise at 80 mph at a little over 2750 rpm...and still take it up to 180 mph. There was no simple answer to getting a chain to work so we redesigned the swingarm. There is no cush drive on this year. Hot Rod baggers are the norm these days with street racers pouring money into big 124/126/131/and 145 cubic inch engines, with high lift cams and lots of compression for street racing and bragging rights. Only by going to chain drive can you have a true high performance drivetrain and the flexibility to gear up or down which is impossible with the stock belt drive. Our 126 ORCA 360 hp Turbo Road Glide aka "Road Toad" has a chain final drive as does Mike Geokan's 139 ORCA 535 hp Bonneville Bullett. Both run the EK530ZZZ chain. RB Racing offers a swingarm conversion service for Harley-Davidson Twin Cam FLT/FLH models. If you want your swingarm modified you must send RB Racing the items listed in 1-4 below and provide the rear sprocket size required. 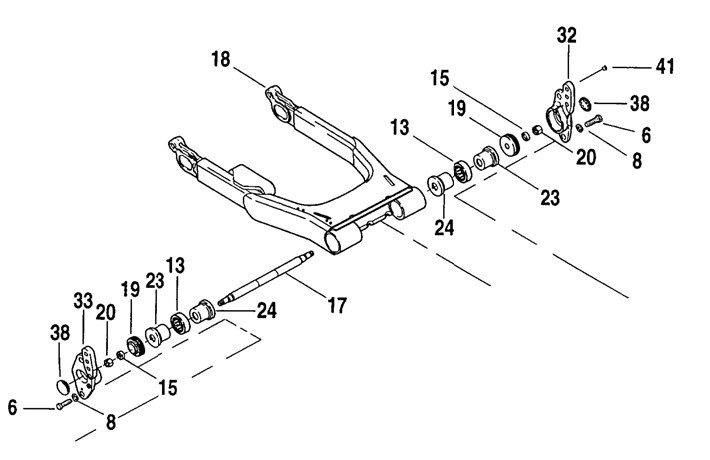 Below drawing is just to show that items #13 and #24 must be left in the swingarm. 1. Your swingarm, Send with bearings (#13 above) and Inner spacers (#24 above) installed. Do not remove these. 2. Your rear axle and axle nut. 3. If you have a 2009 later cush drive wheel these require our Billet Cush Hub. 4. You must specify the number of teeth desired in your rear wheel sprocket. 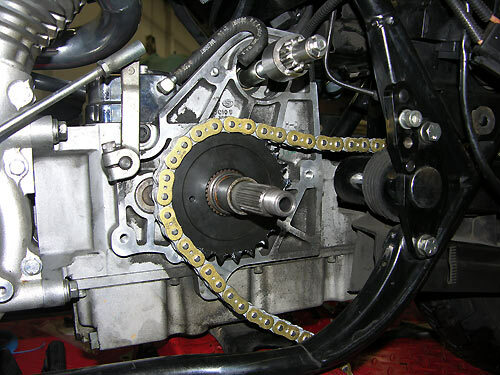 A 51 tooth rear sprocket with a 24 tooth countershaft (pre 2009 models) gives the exact ratio as does the 2009-2012 FL stock gearing (OEM: 32 transmission, 68 rear sprocket). 26/55 (2009 and later models) also gives a stock ratio. 2. A 120 link Gold EK ZVX3 530 O-Ring Chain. 3. 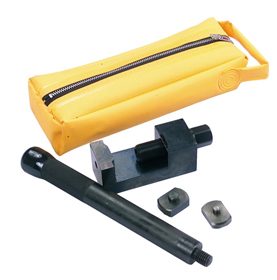 An EK Chain Rivet Tool. 4. 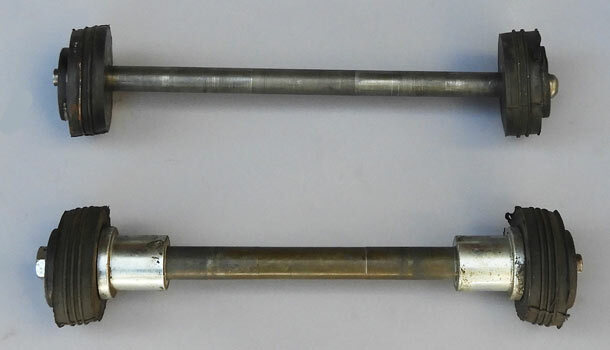 Two Chromed Chain Adjusters. 5. Your rear axle and nut modified for chain drive. 8. 2009 and Later Touring: A billet Cush Drive Pulley machined for a #530 final drive sprocket. Your swingarm modified for 2" adjustment chain drive operation and completely refinished (Black or Silver). Complete Drive Kit (Including 1-7 above): Pre 2009 Twin Cam Swingarm (not cush drive), Gloss Black Powdercoated Finish. Complete Drive Kit (Including 1-8 above): Swingarm 2009 and later Cush Drive, Gloss Black Powdercoated Finish. 142.4 Nm). Install new e-clip in axle groove. 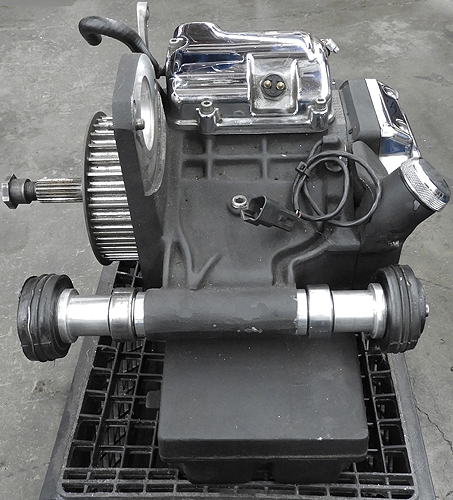 Your 2009 and later FLT/FLH has an integral cush hub pulley. 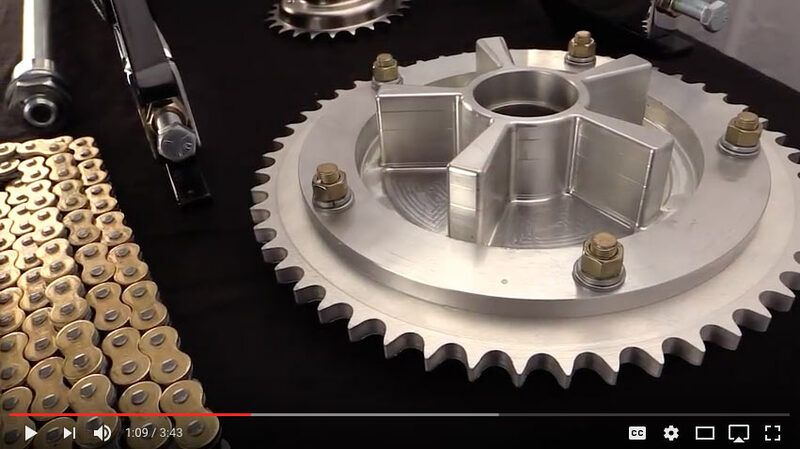 We supply a specially machined, 26 Tooth (2009 and later) transmission sprocket, and a custom machined billet cush hub assembly with a final drive sprocket of choice. 26/55 Teeth rear is standard FLT/H gearing on 2009 and later models. EK ZVX3 530 Gold Chain 120 links. We secure the custom 51 or 53 and 55 tooth sprockets with five 180,000 psi Grade 9 bolts and Grade 9 washers, torqued and Loctited to the billet cush hub, before they leave RB Racing. Note: Spherical bearings in the Swingarm Pivot began in 2002 Model Years. Rear Billet Cushion Drive Hub only. Two Twin Cam FL Touring swingarms prepared for customers. 2009 and later left, pre 2009 right. OEM swingarms have a thick gloss back powder coating covering the stampings. Customers send us their swingarms with the front bearings left in place and their rear axle and axle nut for modification. 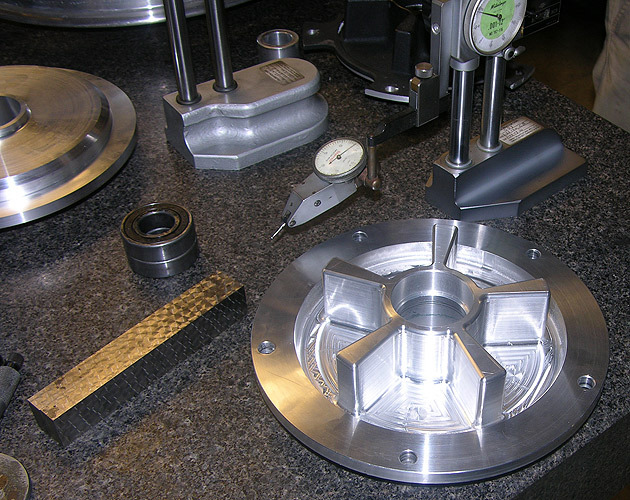 We take customer arms, precision cut and remove the oem adjusters and remove any oem weld splatter. New CNC machined billet ends, allowing two inches of adjustment, are placed in a precision fixture and welded to the arm retaining the stock shock attachment location. Pictured above is a pre 2009 FLT Swingarm. 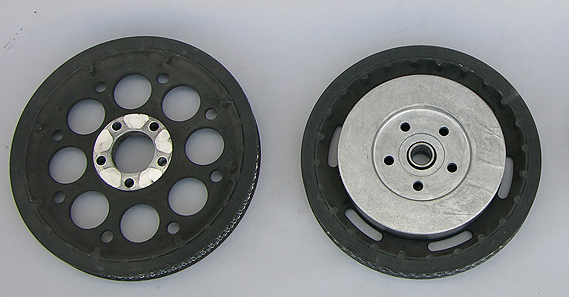 In 2008 Harley started put a bolt-on cush drives on their touring final drive pulleys. For 2008 models simply ditch the cush drive and go sprocket direct. 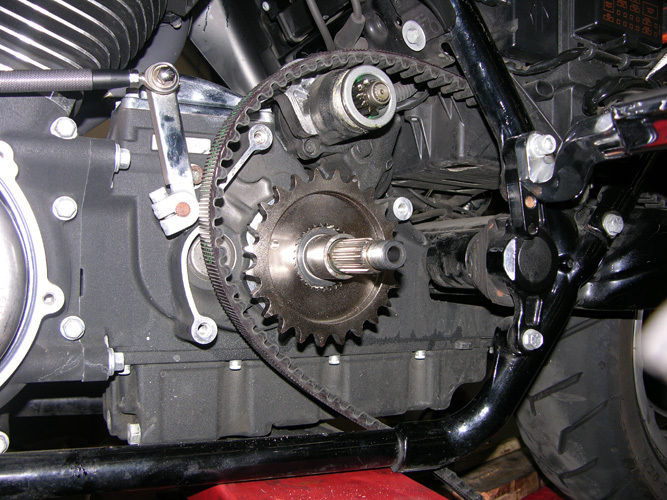 For Pre-2008 models the sprocket can be bolted directly to the hub. Spherical Bearings were first installed on 2002 models. Left to right: Left Pre 2008; Right 2008. On 2008 models the cush drive is removable and the sprocket can bolt directly to the wheel. A 51 tooth rear sprocket is a stock gear ratio. We can also supply 53 teeth for a more aggressive ratio. Speedos can be recalibrated with TTS MasterTune Software. 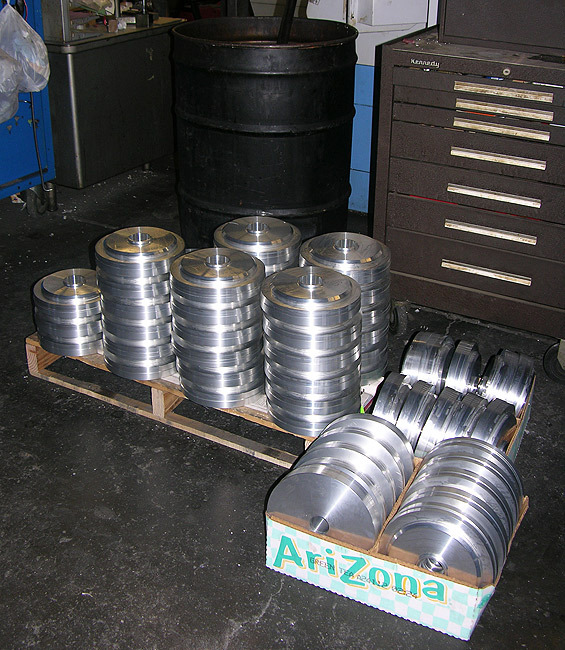 2009 and later require our Billet Cush Hub Assembly. 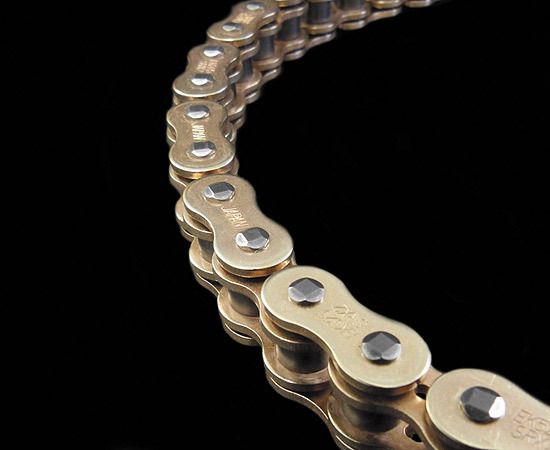 The 530ZVX3 chain has a width of approximately 1", the same as the 2009 and later belts. 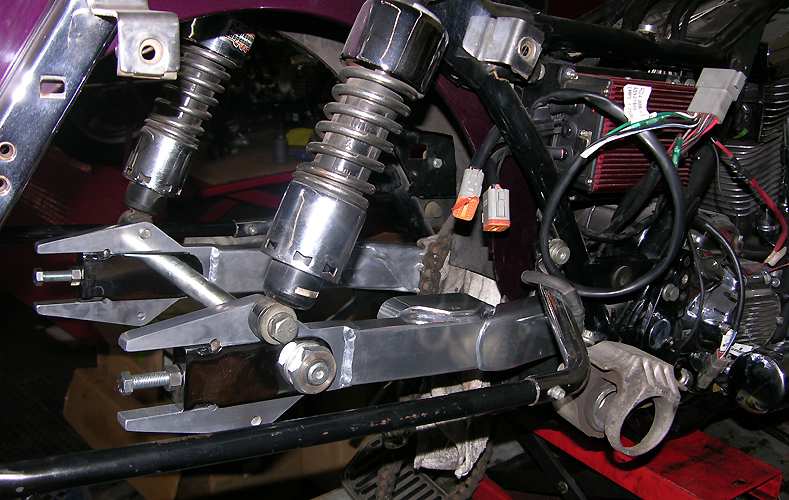 The final drive belt can be removed by placing a scissors jack under the bike and removing the left side pivot assembly. You don't have to cut the expensive belt. You do have to be careful not to nick the belt as this could cause premature failure should it be used again. 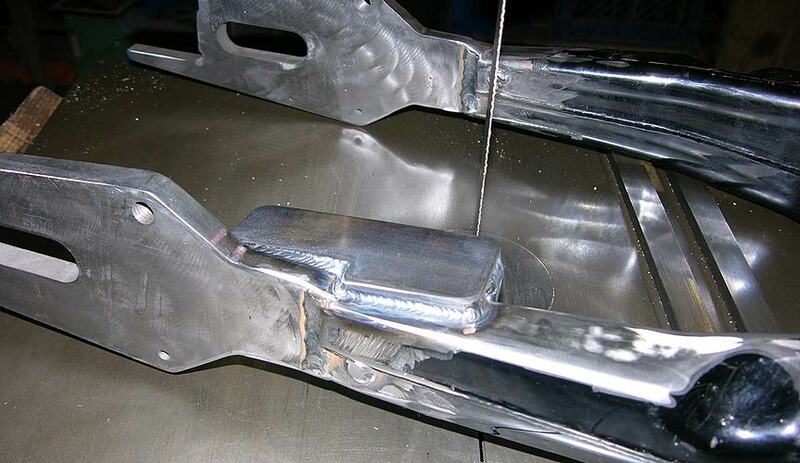 To refinish a Harley Swingarm is not a simple spray can operation. 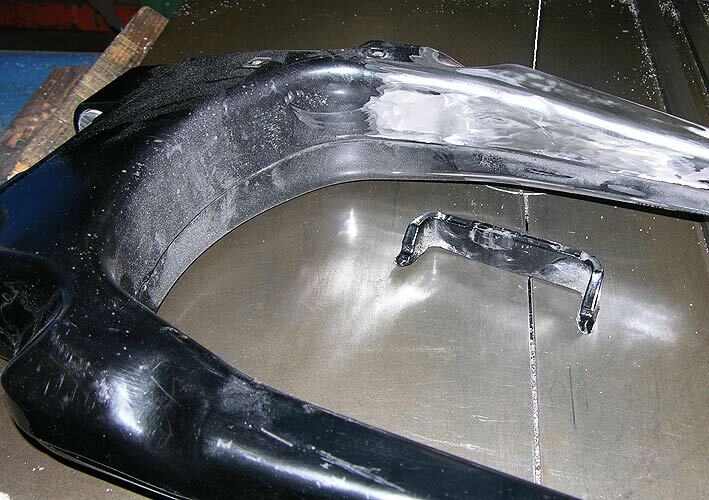 The coatings that Harley puts on their swingarms are a durable hard coat powdercoat paint which is not easily removed. These must be completely stripped and hand finished prior to refinishing in gloss black powdercoat. Stripped arm ready for finishing pictured above. If requested we can install new 9208 swingarm bearings for $100.00. Don't ask us to chrome your swingarm as putting a hollow part with bearings and untreated inner surfaces in acid and chrome tanks is a very bad idea. Putting a 2006 Swingarm on a 1998 Evo Dresser. Replacing the weaker OEM arm with a 2006 arm modified for chain drive. Bike is turbocharged. The installation uses the smaller 5/8" Evo swingarm pivot bolt. You must also install a late model brake caliper. The shocks are in the same plane and location as stock. The swingarm uses all Twin Cam internals. This was done in a silver powder coat. If you are building a big inch FXR the stock swingarm is simply not strong enough. FXR's and FLT/FLH have different shock lengths and shock eye locations. We make a special swingarm for the FXRs that uses a late model, 2002 to 2008, FLT/FLH swingarm that we convert to chain drive. Here is a CVO2 swingarm off of our FXR Turbo with a red arrow showing the weak point, among others, in the stock FXR swingarm when used in high horsepower situations like 300 hp turbos or built 130 hp 124" motors. The Cleve Block bushings have to go and we use the 2002 to 2008 Dresser swingarm with spherical bearings. The later model swingarms are twice as strong and we convert them to chain drive with 2" of adjustment. For high hp it does no good just to upgrade the bearings in a stock FXR swingarm. Go straight to a late model rear wheel with the 25mm rear axle and upgrade your caliper at the same time. You can run a 150 rear tire upgrading from the OEM 130 size, using a 16" or 17" rim. 25mm wheel bearsings. Above: Top axle is 5/8" FXR or EVO Dresser. Lower photo is later 2002-2008 3/4"transmission shaft. If you choose to do this be aware you must change your rear wheel, axle, and brake assembly for the 25mm rear axle and later model brake calipers. Do not attempt to drill or ream your transmission case for the late 3/4" axle. There are no more Delkron FXR cases with 3/4"pivots. We supply the complete swingarm ready to fit your FXR or earlier EVO Dressers. FXR and DResser swingarms have different shock locations. We make the 2002-2008 style swingarms for $895.00 so you can use your FXR's 5/8" pivot shaft with the 2002 to 2008 late model swingarms with OEM 9208 spherical bearings. We supply the complete swingarm modified for the FXR transmission. You use your 5/8" pivot axle assembly, either the earlier two piece or the later one piece assembly. Pictured above is a 1998 Dresser Oil Bag Transmission with the OEM 9208 Spherical Bearings from a 2008 Touring Swingarm. The 5/8" pivot shaft is retained. Also works also for 1998 and earlier EVO Dressers wanting to put on a stronger swingarm. Pictured above is our FXR Turbo Orca swingarm with 1" higher shock mounts. It has 2" of adjustment for the chain drive and uses a 25mm late model axle for a 17" Dyna rear wheel. 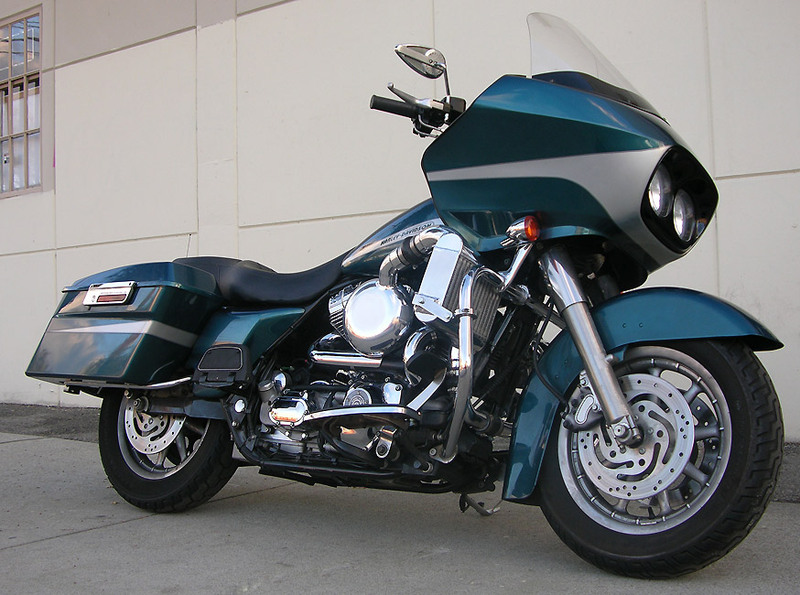 The 2008 Swingarm has been modified to use our 5/8" 1999 FXR CVO2 transmission pivot shaft. A late model 4 piston CVO Dresser caliper provides the rear stopping power. We are using a 1998 Dresser Oilbag 5 speed transmission with Jims Fat5 gears. We raised the shock mounts to use with 14" shocks to get 7.5" of ground clearance with the smaller diameter 150 x 60-17 rear tire. We are also using +2" front fork tubes as we are also running a 17" front tire with the original 3/4"axle. Pushing 300 hp through the stock FXR swingarm which can crack in the adjuster area was not agood idea. Stronger is better. The only chain we supply is #530 EK ZVX3 lubricated O-Ring chain which is the same chain we use on our 535 hp Bonneville Bullett. You must use the special billet EK rivet tool which turns the O-Ring chain into a strong 11,100 psi chain that will not stretch or break. 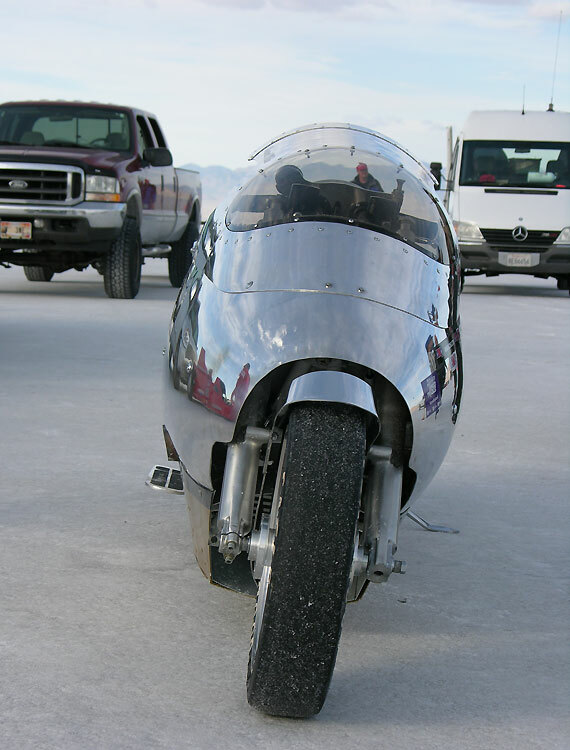 Absolutely do not use "Drag Racing" chains like the EK530DRZ2 which is not a street chain...At Bonneville it would overheat due to its construction which is only intended for short duration and not street use. The 530ZVX3 chain we use has an EK wear factor of 1700 (good) whereas the drag racing EK530DRZ2 has an EK wear factor of 200 (poor). Best to measure things twice before you cut the chain by grinding and pressing off the links you do not need. Using a couple of plastic tie wraps allows you to move the adjusters back and forth to see exactly what links you want to remove. In this case we ended up with a location about 5/8" futher back than stock. The longer adjuster bolts are not needed so we'll put in the shorter bolts supplied. 2004 FLTRI shown. Note: If you intend to use the lower plastic belt cover you will need to cut off the inner lip.